Get in touch with us for obtaining high quality Cow Ghee as we are a dependable supplier in the town. With diligence, hard work and dedication, we have worked our way up and become established provider in Kuala Lumpur (Malaysia). 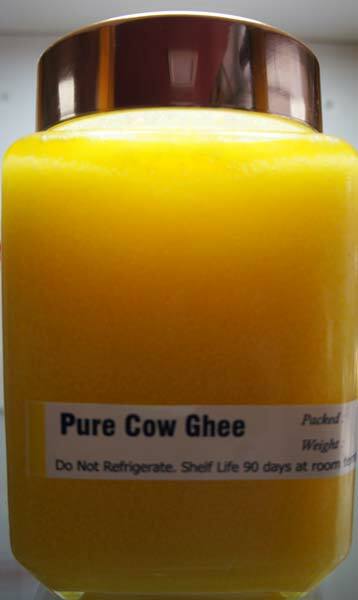 We are reckoned as one of the reliable Cow Ghee Exporters in the entire industry. We claim it with full pride that we are the best Pure Cow Ghee Exporters for the entire world. For those of you who love to add a desi touch to your food, we are now Desi Cow Ghee Exporters as well. So, get in touch with us at the soonest to make full use of this opportunity that is offered to you by us. This is 100% pure premium cow ghee. This ghee has been prepared from indigenous & grass feed cows only. This is prepared by traditional hand churned method. No machines and no chemical used. Other than edible purpose, this ghee is also used for ayurvedic, divine and traditional activities. Pure ghee is good for health. This ghee is made fresh every week based on the orders that we receive.